Simplex Hi - Hi Impact Repair Acrylic is a super-strong self-curing denture base acrylic designed for additions, repairs, and relines to high impact strength dentures. Easy to process. Maintains dentures that are resistant to breakage and fracture. Colours to match Acron Hi. Simplex Hi powder mixes easily with Simplex Rapid Liquid, cures quickly using hydroflask or bench cure techniques and is easy to trim and polish. 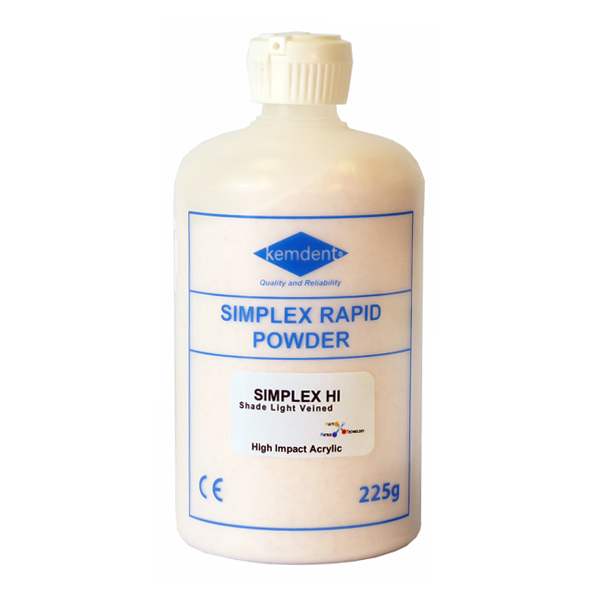 Dentures can be repaired with Simplex Hi powder using the same techniques used for Simplex Rapid powder.